↑ "Letter 5145 – Darwin, C. R. to Wallace, A. R., 5 July (1866)". Darwin Correspondence Project. Retrieved 12 January 2010. Maurice E. Stucke. "Better Competition Advocacy" (PDF). Retrieved 29 August 2007. Herbert Spencer in his Principles of Biology of 1864, vol. 1, p. 444, wrote "This survival of the fittest, which I have here sought to express in mechanical terms, is that which Mr. Darwin has called 'natural selection', or the preservation of favoured races in the struggle for life." Weinstein, David (2008-02-27). 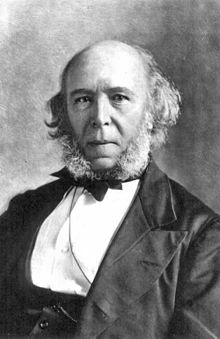 "Herbert Spencer". Stanford Encyclopedia of Philosophy.